Finally, after 2 days of fiddling around with this hardware, including testing with Raspbian (Wheezy), Raspbian (Jessie), and OpenELEC OS, I was able to successfully get Kodi 15.2 via OpenELEC 6.0.3 up and running. I had absolutely no success with the Stalker PVR Client on Raspbian, so I opted for the unified media experience with OpenELEC. It's great. It automatically detects and installs drivers for my wireless network and keyboard / mouse receivers. Raspberry Pi 2/3 - I bought mine on sale from Amazon for $36. HDMI capable display - I used my computer monitor and TV for testing. Internet connection - I used the EdiMax USB Wireless receiver from my starter kit. 8 GB or larger MicroSD Card - Mine was a Class 10 Kingston from my starter kit. Micro USB Charger - Mine was included from my starter kit, but I've seen 5-star recommendations of a 2 amp one. Let's start by downloading the OpenELEC image from their downloads page. Select the "Diskimage" option. Unzip the image package you just downloaded. Write the disk image to your micro SD card. Use the instructions on this page for the platform you are using. Boom! 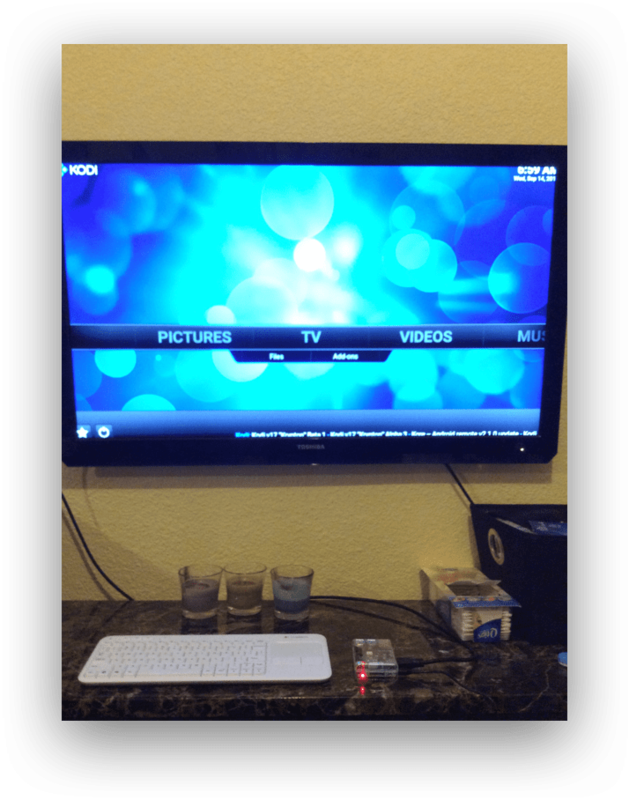 You have now installed an entire powerful, open-source media center OS on your Raspberry Pi. On a side note... Look how tiny that thing is compared to my 40" TV. Here are a few quick links to navigate the menus. To setup wireless networking, go to System -> OpenELEC -> Connections and select the network and credentials to connect. It should "State: ready" when it is connected. OpenELEC will automatically connect to this network when it starts up. To check for updates, go to [left arrow] -> Check for Updates. This will automatically update your add-ons and your repositories. To install add-ons, go to System -> Settings -> Add-ons -> Install from repository -> [select repository] -> [select application] -> Install. To launch add-ons, go to System -> Settings -> Add-ons -> My add-ons -> [select application] -> Launch. Follow my install instructions to install the client from OpenELEC repository -> PVR Clients -> Stalker Client. Enable TV and Synchronise channel groups with backend(s) from System -> Settings -> TV -> General. This one is IMPORTANT. I experienced constant screen refreshes up until I did this one. Power off the machine and back on again. I used the power icon from Kodi. Voila. You are all setup and running. Your TV option will be reloaded once channels are loaded - there will be a banner to indicate they are being loaded. Enjoy your cheap media center. What are you waiting for? Cut the cable. Please comment or email me if you have any questions!